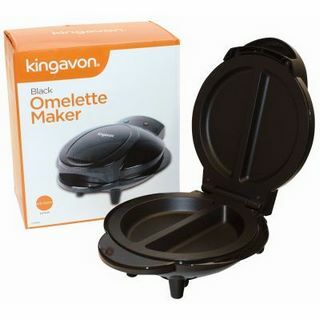 This 800W omelette maker from Kingavon comes in a choice of black or white and is manufactured with non-stick coated plates making it easy to remove omelette once cooked and easy to clean the maker when finished. 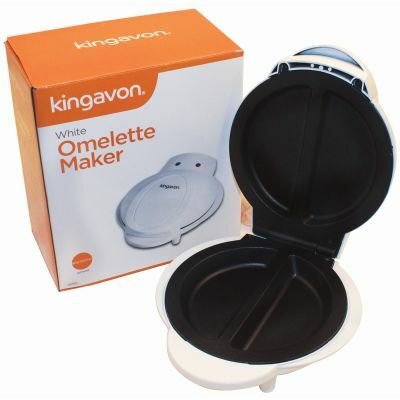 Designed to heat up in seconds and cook a healthy omelette in minutes without the need for oils or frying pans. The maker features a cool touch handle and non slip feet. It also features a power on and ready light indicators. It can also stand upright for space saving compact storage. 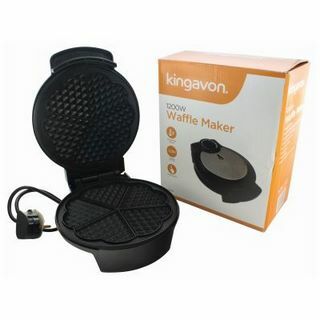 The Omelette Maker can also be used to make pancakes, toasted sandwiches or waffles. 2: A green light will illuminate to indicate power. 3: When the red light illuminates the omelette maker is up to its operational temperature. 4: The red light may flicker on an off to maintain the correct cooking temperature. 6: Use the cool touch handle to open and close the lid as you cook the food.